Now that Doctor Strange is set for a sequel, I am hoping to see some more Marvel characters make their debut in supporting roles. Brother Voodoo was teased in the first film and would be a blast to see. I'd also love to see Gargoyle, maybe he could be trapped in Nightmare's realm or something. It could be a building block to a comics-accurate defenders movie down the line. I'm not sure how you'd get the artwork to match but it would be a hoot to see Jim Corrigan and Gadget. The Spectre and the Inspector. I'm wondering who they'd get to play Namor in a Defenders flick. Orlando Bloom, maybe? He's already used to wearing prosthetic pointed ears! @Harry Bean - Mordred vs Mordru? I'd love to see Gargoyle in a Marvel film. There should be room in the next Dr. Strange movie for some future-story cameos at the very least! @Cary: Or maybe Zachary Quinto? @Bob Buethe: you mean, the new Dr. Spock? @last Anonymous: Clearly Not A. Trekkie. You mean Mr. Spock. Dr. Spock (first name Benjamin) was a famous pediatrician and author. I'm supposing that this story is an extension of the earlier goings-on with Dr. Mid-Nite and Ghost Rider. That might eventually lead to a Justice Society/Defenders team-up (yes, I know that Gargoyle and Ghost Rider weren't Defenders at the same time, and the Ghost Rider in question was Daniel Ketch as part of the "Secret Defenders"... but that doesn't have to be the case on Earth-STF). 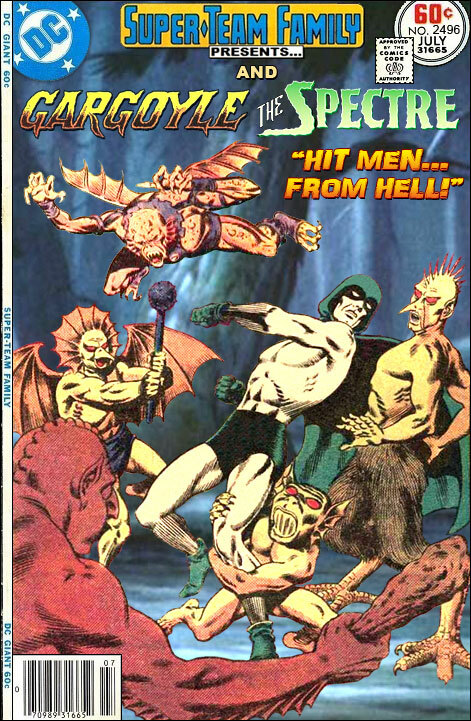 Bob, this cover started with an splash page from The Spectre's first series, with Gargoyle from an interior Marvel Team-Up Page plus a new background taken from a classic animation cel. sometimes it's tough trying to blend a glossy cover image with a faded interior one - I have to fiddle with the brightness, contrast and saturation controls to get them to look like they go together.